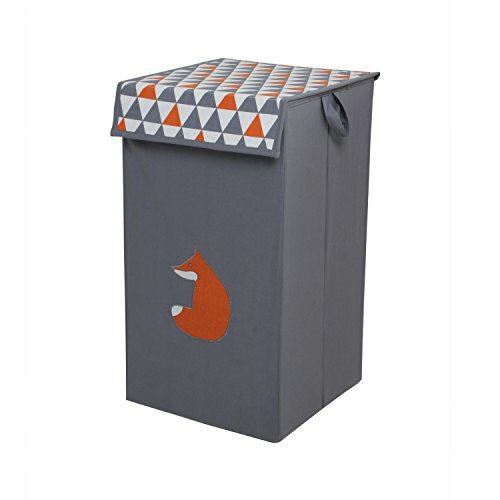 Bacati - Playful Foxs Orange/grey Collapsible Hamper made with fabrics to match the collection. This Baby Hamper features coordinating fabrics. All the fabrics in the shell are 100% Cotton percale fabrics with MDF inserts for strength. It keeps baby's laundry organized and out of view. Dimensions 22"h x 14"w x 13"d. It coordinates with the Bacati Playful Foxs Orange/Grey Bedding Collection. See the entire rest of Bacati Playful Foxs Orange/grey Collection for endless Mix N match possibilities. Cotton is breathable making it more comfortable in extreme climates. Cotton is inherently soft delicate on skin of babies, durable & user friendly. Cottons gentle quality makes it appropriate for Babies with very sensitive skin or skin allergies. If you have any questions about this product by Bacati, contact us by completing and submitting the form below. If you are looking for a specif part number, please include it with your message.